The key feature of Russia's evolving new strategy is an attempt at changing the narrative on Syria from one depicting a civil war to one presented as a humanitarian emergency that deserves massive international aid. Russia's other aim is to divert international attention from the investigation of war crimes and crimes against humanity that might concern not only Assad but also Moscow's own military in Syria. A glimpse of the new Russian narrative was offered by Moscow's senior diplomat Evgeniy Zagayanov earlier this year in a paper presented to the United Nations Security Council, proposing a project to clear minefields created by ISIS in and around the desert location of Palmyra. The Security Council put the demand on the backburner after members argued that tackling the humanitarian problem in a serious way would require the removal of hurdles set by President Assad's government. "The issue of humanitarian assistance to Syria cannot be reduced to the issue of blockages and hard-to-reach regions," Vladimir Safronkov, a senior Russian diplomat, told the council a few weeks later. Since then, Moscow experts have been working on what is labelled "master plan for relief and rebuilding in Syria." The plan envisages separate projects to restart and revitalize such key industries as oil and gas production, the extraction of phosphates, and the reopening of regional trade routes. Russia has already presented a plan, estimated to cost over $300 million, for demining 40 per cent of Syrian territory within 22 months. According to David Butter, a Syria expert with Chatham House in London, the Kremlin has already enlisted a number of Russian firms to pick up putative contracts in all those fields. The next plank of Russia's new strategy consists of extending the so-called "de-escalation zones", currently limited to five or six localities in the south, to other parts of Syria with Idlib province regarded as the next priority. "Russia is trying to freeze the political situation and the reality of control; on the ground," says Ahmad Ansari, an Iranian researcher. "Once a de-escalation zone is set up it would matter little who is in nominal control. And, in time, people will come to focus on possible reconstruction projects [rather] than the nature of power in Damascus." However, the proposed "frozen situation" would require at least two things: a minimum of municipal administration and a police presence to impose a minimum of security. Moscow is trying to deal with the first problem with a plan for installing provisional municipal councils in "de-escalation zones." A team of administrative experts from Moscow are expected to visit Syria next month to help with the planning needed. That would put Russia as a "firewall" between the Assad regime, kept in distance in Damascus with nominal control, and the opposition forces in actual control on the ground. To solve the second problem, Russia is already training special police units for deployment in Syria. According to Moscow sources the first batch of 80 policemen are expected to arrive in Syria in September after a special course including training in Arabic language. According to Moscow sources, President Vladimir Putin evoked the outline of the proposed "master plan for relief and rebuilding in Syria" during his meeting in Hamburg with US President Donald Trump. Russians believe that Trump, with his background in construction and real estate, would be more likely to appreciate the "master plan" than classical politicians. Russia also hopes that the marginalization of Iran in Syria, implicit in the new Moscow strategy, may be an added an incentive for Trump, who seems determined to clip Iran's wings through all means short of military intervention. Western experts put the cost of a comprehensive reconstruction program in Syria at over $1.2 trillion, something that Russia, with its economy in dire straits as a result of sanctions and the fall in energy prices, is in no position to offer. In fact, earlier this month Tatyana Gulikova, head of the Russian Pubic Accounts Office, reported that the number of Russians living below poverty line rose by a whipping two million, to a total of 22 million in 2016, compared to the year before. According to Oleg Buklemishev, a Professor at Moscow State University, even if the Russian economy returns to growth in 2017, Moscow would still be in no position to maintain domestic social spending commitments while spending vast sums on foreign policy projects such as involvement in Syria. Dangling the "master plan" for rebuilding Syria may also whet the appetite of the European Union at a time it is desperate to seek stimulants for its stagnant economy. According to French sources, Putin raised the issue with French President Emmanuel Macron in their meeting in Versailles last May. The "master plan" also appeals to Turkey, whose major construction firms have sustained heavy losses, especially after being forced to leave Libya after Muammar Kaddafi's demise. The same firms also face a more hostile environment in other Arab states as well as the European Union. Both Jordan and Lebanon are also keen to see an injection of new financial resources into the region's economy through the Syrian "master plan". In his meeting with President Trump in Washington, Lebanon's Prime Minister Sa'ad Hariri even expressed the hope that his country would be seen as the launching pad for the rebuilding of Syria. On the domestic front, the new "relief and reconstruction" narrative may appeal to Russian Muslims, some 20 per cent of the country's population, who are concerned about Russia's involvement in massacring Syrians. 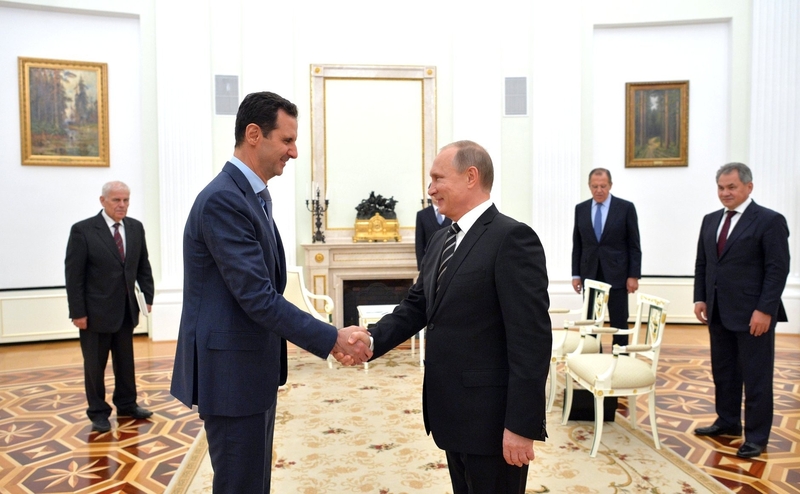 It is too early to obtain a full picture of the new Russian strategy in Syria. It seems to be a collage of disparate political, security and economic concepts that may prove to be contradictory rather than complementary. The Russian strategy would reduce the remnants of the Assad regime to a mere ghost of a government. That may please Assad's opponents but would leave unresolved the fundamental issue of who should govern Syria. Russia may be able to secure the small percentage of Syrian territory it needs to protect its bases on the Mediterranean, but will not be able to provide the financial and human resources needed to provide a credible measure of stability to other parts of the country. With both Iran and Turkey busy carving their own enclaves in Syrian territory, the country's fragmentation may become a fait accompli. On a smaller scale, France tried a similar policy in the Central Africa Republic and Congo-Brazzaville during their respective civil wars. The result, in both cases, was a signal failure. Even if the Russian plan garners the support it needs, it will solve nothing in the medium- and long-term; the key problem is who should govern Syria on whose behalf. Trying to change the public perception of what Russia is doing in Syria doesn't change the facts. The Russians are there to protect their access to the naval and air bases which allow them to project power beyond their immediate surroundings, and to prevent the construction of proposed gas pipelines through Syria that would create unwelcome competition with their gas sales to Europe (which was the cause of the campaign to replace Assad with a government that would allow the pipe to be laid across Syria, and led to the present situation). The principal and most serious problem with Arab speaking nations, and what the "West" simply does not get or understand, PERIOD: Is that, true Democracies in these countries, with elections simply do not work, nor will they ever work. Typically, as an historical fact, the US goes in wreaks havoc, brings down their governments, (and rightly so in a lot of cases). But, then they bugger off, leaving huge power vacuums. Their culture is comprised of tens and in some case hundreds of tribal factions, all vying for power. Historically, the only times that they have had a "collective peace" is when governed by a very strict leader, with a very heavy handed approach whom governed with a rod of iron. I have a great many friends from the Middle East and it is they (corroborated historically) that tweaked me to this reality. As well, historically, whenever this "leader" becomes too tyrannical he ends up getting overthrown. They do not really give a damn for "elections" and most will not even participate. All they want is to be governed fairly and to have a roof over their heads and 3 meals a day. Just like any other working stiff. Until the "West" (so called) wakes up to this reality; that these are literally insurmountable cultural differences, then history will simply keep repeating itself. Putin gets this very clearly as he references this situation in one of his interviews. But of course the US Congress is so busy extracting unwarranted and unjustified punitive punishment against Russia and by extension, its own European allies that they have no interest in listening to his very clear understanding of exactly what is being dealt with here. I read most if not all your articles and if your facts are correct (not doubting) why are our political leaders so blind? I have asked this question many, many times. When the facts are being placed right in front of them why are they not prepared to act and so swiftly? What artificial Syria needs is to be divided into states for the different nations and religions. Arm them and train them to defend themselves from their neighbors. Then do the same for Iraq. In the north of both artificial states is the ancestral land of the Kurds. Kurdistan now!